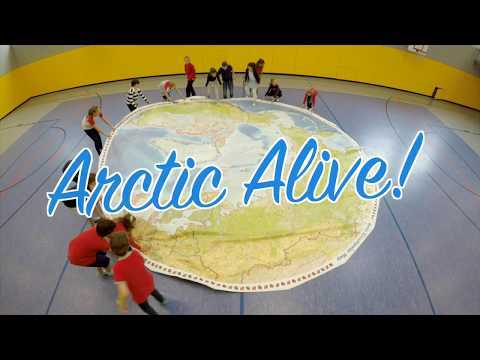 The Arctic Alive giant floor map program is a free resource offered to teachers of Keystage 2 students and is specifically aimed at Years 4-6. Maps come in two sizes: 6.5 x 6.5 meters and 7.5 x 7.5 meters. Resources include: map legends, activity cards, props and more. In addition, a teacher guide with five curriculum-linked activities will help bring the map to life. 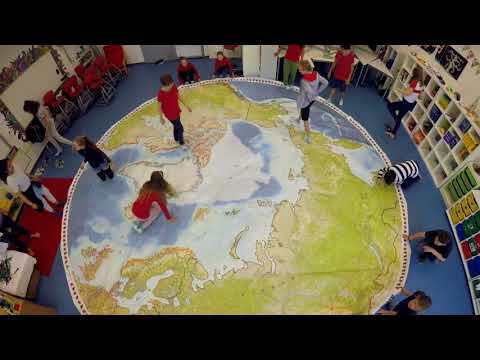 With a diameter of almost eight metres, when this circular map is unrolled onto a gymnasium floor, it will enable your students to explore the Arctic as never before. Does your school have an indoor space that is at least 8 x 8 metres? Wish to incorporate new and innovative teaching tools into your classroom? Within a few weeks of your email you will be contacted to coordinate the free shipping of the map to your school. William Bates, volunteered to create a logo for Arctic Alive. He is eighteen and is studying Visual Arts and Design plus Interactive Digital Design at The BRIT School. William is currently working on a re-branding project with a company in Shoreditch to enhance the Art Department at the BRIT school, which is celebrating it’s 25th Silver Anniversary this year. William also intends to study Art and Design at University. Chorus Art kindly supported the creation of the Arctic Alive explanation videos. Standard Life supported the Edinburgh University Canadian Studies programme for over 16 years from 1990 – 2005. Duncan Jessiman, through the Jessiman Foundation, supported Edinburgh University Canadian Studies programme in 2007, 2008 & 2009.